Chapter 2 of TCCL consists of an overview of several existing theories of technology that Borgmann wants to use as partners in dialogue, in the process of constructing his own theory. The pre-theoretic, simplistic view of technology is pragmatic: science and technology have proven their validity and usefulness through the effective solutions they boast to real problems. Since it is obvious that technology has indeed solved such problems, any more nuanced theory will have to be presented with the utmost precision and care. (Here I think Borgmann is justifying the level of detail he will be going into in this section of the book). In the simplistic “default” view, technology is basically “applied science and engineering” (8). By this Borgmann is saying people generally think of technology merely as what happens when scientists and engineers do work in the world. He claims this leaves technology too narrowly defined: there is no room for fruitful inquiry into technology’s deeper essence if it is defined purely functionally. So a real theory of technology would offer a more engaging perspective. The substantive approach. On this view, technology is a force in its own right. It isn’t understood as a personal force, but just something which is not reducible to other principles. In other words, it’s a basic element of modern existence, rather than something which is explained by reference to other elements. As a matter of practice, most substantivists tend to portray this force as negative (and so are called anti-technologist or Luddite). 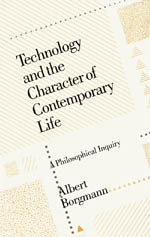 While Borgmann lauds the simplicity of this view (technology simply is) and the fact that technology as a basic force is seen to have its own characteristic essence, he thinks substantivists do not adequately meet the challenges posed by the apparent success of technology in meeting the world’s problems. Stridently declaring technology evil does not deliver the requisite insight! The instrumentalist approach. This is perhaps the most common theoretical position; it sees technological devices as the evolution of the simple tools humans have been using since the dawn of our species—there is fundamentally no difference between a hammer and a computer. On this approach, Borgmann notes that the primary question concerning technology becomes: what ends are these tools used for? This division between ends and means finds a congenial home in our liberal democracy (by which Borgmann means this kind of democracy), wherein “it is the task of the state to provide means for the good life but … to leave to private efforts the establishment and pursuit of ultimate values” (10). In other words, the state is free to make available any kind of technological development, but not to say what kinds of ends are appropriate for their use. Borgmann admits that instrumentalism is on one hand true (technological devices and tools are indeed analogically related, and the distinction between ends and means is indeed a real part of our current experience), but claims it misses several important points. The first is that the distinction between ends and means itself is a novel thing which did not exist in pre-technological society. Secondly, technological “ends” consistently find their realization in supporting a ruling elite and exploiting the poor, which suggests there is something more complicated going on than the use of tools. The pluralist approach. Borgmann defines this perspective rather vaguely (in my opinion), describing it basically as the position that there can be no comprehensive approach to technology; at the end of the day, all we have are anecdotes about society’s engagement with machines, and there is no discernible underlying pattern. While this approach can (technically speaking) handle every observed fact or situation, Borgmann claims it does so at the cost of failing the test of reality: technology does have a character which runs through all the instances of its use, and it moreover has a real effect on the world. As he says, “in modern technology the face of the earth is transformed in a radically novel way” (11)—I leave it to the reader to imagine all the ways the earth has been literally transformed by machines. After this brief review, Borgmann describes the kind of theory of technology he wants to build in TCCL. It should make bold and radical claims, it should explicate the character of technology (i.e., make it easier to observe and understand), it should on one hand reflect common-sense intuitions while on the other hand avoid superficiality, and finally it should emerge from an observation of actual events and situations (i.e., it should have empirical grounding). As we move into the next chapters, Borgmann will lay out the ground rules for developing and substantiating such a theory. For example, we’ll engage in some philosophy of science (“What is a theory, and what makes a theory good?”). We’ll also look at the relationship between technology and science—is it as close as we normally assume? We’ll begin to explore that question in Chapter 3. I think that this chapter raises the important point of how we approach technology: social, technical, political. Interestingly modern technology can erode radical distinctions. That society and politics is in the ‘thrall of a radically new and different force.’ In understanding this, technology is not prohibitively complex (pluralist view) and not a fully determining force (instrumentalist view). It is a force (substantive). @Matt: Yes, exactly. Something else I’ve read recently makes the good point that at this stage in our social development technology is so broadly mixed in with society that we had best consider it not just as a phenomenon worth explicating, but as the very ontology of modern society. Modern life exists within technology rather than the other way around! This is like the ‘garden’ as an oasis within technology — an image Borgmann brings later.